U.S. 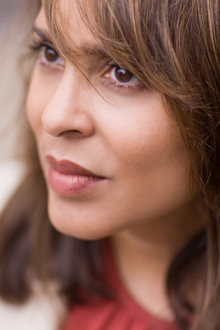 Poet Laureate and Emory University professor Natasha Trethewey. U.S. Poet Laureate and Emory University professor Natasha Trethewey will join PBS NewsHour correspondent Jeffrey Brown for the final installment of their "Where Poetry Lives" series—a visit to Antioch University in Los Angeles to profile a Master of Fine Arts program that compels its students to perform community service to enhance the writing life of others. The story airs Tuesday, May 20, on PBS NewsHour. The program, the brainchild of former L.A. Poet Laureate Eloise Klein Healy, tells its students that poetry "is not just about the work on the page. It's about where you put your feet when you get out of bed in the morning." As Brown and Trethewey discover in speaking to a mix of current and former students, the program is so rewarding that some graduates have continued with their community service projects. As one former student, who works with incarcerated youth, puts it, "I think it's important to acknowledge that everyone has something to contribute, whether you're in a jail cell or a dorm room, you have a story to tell." The program airs locally on Georgia Public Broadcasting at 6 p.m. and 10 p.m. and on Atlanta's WPBA at 7 p.m.
Remembering civil rights history, when 'words meant everything.' On a 100-mile journey from Mississippi to Alabama, Brown and Trethewey examine the role of poetry in advancing the movement's message for justice and freedom. Seattle's Pongo Teen Writing Project helps homeless and incarcerated teens overcome trauma in their lives by writing from the heart about difficult experiences. Detroit's InsideOut Literary Arts Project places professional writers and poets in inner city schools to help children give voice to their often turbulent lives through poetry and writing. Alzheimer's Poetry Project, uses poems commonly memorized and recited in youth, to bring joy and to trigger long term memories in dementia patients, not just of the poems, but of family members and their own identity. Dr. Rafael Campo uses poetry to help medical students hone the art of medicine. PBS NewsHour's coverage of poetry is funded by the Poetry Foundation. The “Where Poetry Lives” series is a partnership with the Library of Congress' Poetry and Literature Center. PBS NewsHour is seen by more than 4 million weekly viewers and is available online, via public radio in select markets and via podcast. The program is produced with WETA in Washington, D.C., and in association WNET in New York. Major corporate funding for PBS NewsHour is provided by BAE Systems, BNSF, Charles Schwab and UnitedHealthcare, with additional support from the Corporation for Public Broadcasting, Carnegie Corporation of New York, the J. Paul Getty Trust, the William and Flora Hewlett Foundation, the John D. and Catherine T. MacArthur Foundation, National Science Foundation, the Alfred P. Sloan Foundation, Friends of the NewsHour and others.